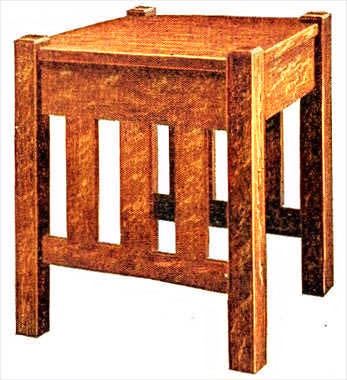 Build a classic mission-style end table. Click here for detailed end table plans. 4 posts, 2 in, square 30-5/8 in., S-4-S.
4 upper rails, 7/8 by 6-1/2 by 22-1/2 in., S-2-S.
2 lower rails, 7/8 by 3 by 22-1/2 in., S-2-S.
2 top pieces, 7/8 by 12-1/2 by 24-1/2 in., S-2-S.
6 slats, 3/8 by 3-1/2 by 15-1/2 in., S-2-S.
1 stretcher, 7/8 by 8-1/2 by 21-1/2 in., S-2-S. 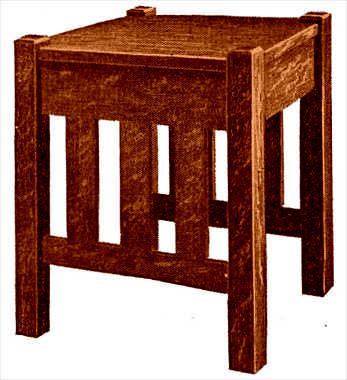 This table may be made with mortise and tenon joints or with dowels as desired. If dowels are used, the upper and lower rails should be made 2 in. shorter than shown in the drawing. Be sure to get the pieces for the posts with their surfaces square to each other and their ends sawed square off. This will simplify the assembling a great deal. Make the posts exactly the same length, 30-1/2 in., and chamfer a 3/8-in, bevel on their tops. Square up the four upper rails, 6 by 22 in., marking the working face and edge to work from when laying out the tenons later. Square up the two lower rails, 2-1/2 by 22 in. These must be exactly the same length as the upper rails. The two ends of the table having the slats should be glued up first. Lay out the tenons on the upper and lower rails for these two ends and be sure to work from the marked face and edges, using a knife line. Cut the tenons, and, by placing them against the posts in the exact position they are to occupy, mark the places for the mortises. These joints should be numbered so that each mortise may be cut to fit its own tenon. Square up the slats, 3 by 15-1/8 in., and cut mortises in the upper and lower rails 1/4 in. deep to let them in. The number of these slats, their size and spacing may be arranged to suit one's own idea. Put the posts, upper and lower rails, and slats together without glue first to determine if the parts fit properly, and then glue and clamp them together. Hot glue will hold best, if the room and lumber are warm; if not, it is best to use ordinary liquid glue. While the glue on these two ends of the table is setting, the other upper rails, top, and stretcher may be finished. 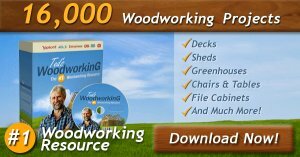 The top will have to be made of two or three pieces joined together with dowels and glue. If possible, use only two boards and be sure the grain in both pieces runs the same way when they are put together. After the ends which were glued have set at least 24 hours, the clamps may be taken off and the other two upper rails tenoned and mortised in place. The stretcher may be held with two 3/8-in. dowels in each end, or with two round-head screws put through the lower rails. When gluing up the whole table, be sure the sides are square to each other. The top may now be squared up 24 by 24 in. and the corners cut out for the top of the posts. The top may be fastened as shown at A and B in the drawing, or by cleats screwed to the inside of the upper rails and top. Before staining, be sure that all surplus glue is scraped off and the surfaces sanded clean. The table can be finished in any one of the many mission stains available.